One of the men of a former president, Goodluck Ebele Jonathan has promised to provide free transportation for voters next week Saturday. 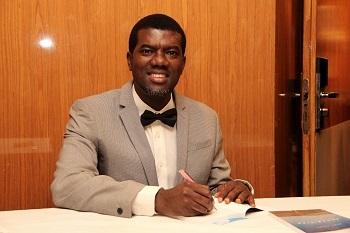 Former Presidential Aide Reno Omokri has pledged to provide free bus rides for Nigerians intending on travelling to vote after last week's postponement. Reno is a staunch supporter of the Peoples Democratic Party and consequently the presidential candidate of the party, Atiku Abubakar who is gunning for the seat of the incumbent leader, President Muhammadu Buhari. "God willing, I‘ll provide modalities/logistics for the buses. I wish I was rich enough to provide buses to and from all the geopolitical zones, but for now my pocket can only afford 4 zones. But if you can help, please do something. Frustrate the frustraters #BusesForDemocracy"